Ost-Europa, Bl. 2: Nordost - Russland. 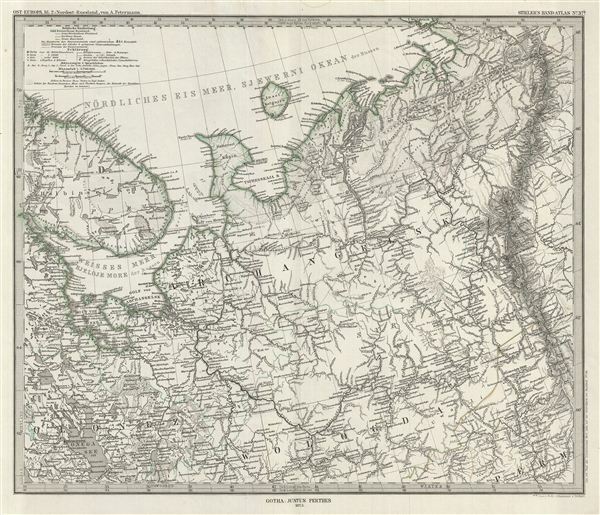 This is a beautiful example of Stieler's 1873 map of northern Russia. The map covers from the Arctic Sea south to the Onega Lake and Petrosawodsk and from the Gulf of Kandalaksa to the Ural Mountains. The Kolguyev Island, unexplored until 1894, are identified as 'uninhabited.' Russia at this time was under the suzerainty of Tzar Alexander the II. Alexander is best known for his liberal reforms including the emancipation Reform of 1861 which liberated Russia's countless serfs and is considered to be the most important event in 19th century Russian history. Map is densely detailed with both political and physical data. Various cities, mountains, roads, rivers, islands and an assortment of additional topographical details are noted. Printed to a high production standard, as was typical of German and especially Perthes/Stieler maps of this period. Published by the Justus Perthes firm for issue as plate no. 37b in the 1873 edition of Stieler's Hand-Atlas. Stieler, A., Stieler's Hand-Atlas (Germany, Perthes) 1873. Very good. Blank on verso. Original platemark visible. Original centerfold exhibits slight wear.